Do you have a home where people stop by unexpected? How do you feel about that? Do you wish people stopped by more or does it really fluster you when they do? Are you limited geographically or do others now know you do not want unannounced visits? If it bothers you when people stop by unannounced, why is that? Let me ask you one more question. If you enjoy your home and it’s a place you want to be, are you prepared for the opportunity to welcome others to it? Sometimes that opportunity provides plenty of time to plan and sometimes it presents itself spur-of-the-moment. Are you prepared when it is more last minute? Do you want to be? I remember back to my lifestyle in college. Granted, funds and privacy were low and youthful ambition high. But I remember how easy it was to welcome others into our living situation. “Come join the fun, we’re glad you’re here! We’re having tomato soup and grilled cheese for dinner! Join us!” Great conversations happened around the dinner table nightly with everyone from our Shakespeare professor to some future husbands. We decorated with whatever we had and cleaned college style. Life was good; hospitality easy. But more than that, because my roommates and I were “family” at the time and creating a home with each other, it spilled over to others. In college, this meant many meals, study-time, and long talks together. Now, in this life season, it means creating a home where children can flourish safely and hard-working parents can take a break. And because I work hard on this for the five of us, it’s much easier to extend it to others. Like my tea corner, it’s in process. I’ve started by wrapping up a few simple gifts and polishing the silver. Can’t lay out treats early so the children aren’t too tempted to sneak or bug me for snitches. But this morning, when we attended our last co-op class for this semester, I told my daughter she could go pick out presents for her teachers as a thank-you. She delights in giving gifts, and I loved being prepared. What helps you practice hospitality at the spur-of-the-moment? Do you enjoy it? Why or why not? I would love to hear your thoughts in the comments below. Our house stays ready for unexpected hospitality by 1) keeping the common rooms picked up and clutter free (easier to do in a kid-free house, to be sure, but not impossible with children – I think of my Mom’s house), 2) having a treat and a beverage (lots of tea, of course) on hand – it may not be fancy, but we can always offer something — our house isn’t anything like what would be in Country Living or any other fancy “Home” magazine – but it is orderly and peaceful. I’m not big on “drop-ins” – especially during the week, and most people know/respect that. It’s mainly because I’m at work full time all day, and then when we get home I’m making dinner and generally taking some time to relax and just enjoy the quiet with my hubby and/or playing with the dogs before I head downstairs for a workout (or get involved in some hobby). During the week, our house is our “haven” – a place to get *away* from people. On the weekend it doesn’t bug me so much if people drop by, as long as everyone pretends not to notice my house, which is generally either in disarray or in the process of being put back in order from the week before. By Sunday afternoon I generally have a good handle on things again – I admit to being a lazy housekeeper most of the time. Regardless though, I always have at least tea at the ready (any kind you’d like – or water, if you’d prefer), and most of the time some small “sweet” to offer (cookies or mini-chocolate bars, or something seasonal we’ve been munching on). 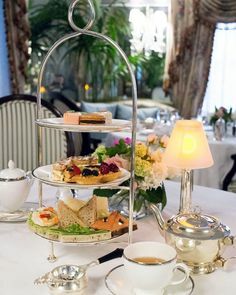 Sweets are easily found either on the covered cake plate, or in a seasonal dish on the dining room table…tea of course must be prepared, and I’ll choose proper teaware at the time. And I am always gracious to guests, whether they are expected or not. I make and sell pumpkin rolls, so I always have several in the freezer. In a pinch I can cut one up for guests, or give one as a gift. Cookie dough, shaped and flash frozen is my life saver, as well as a selection of tea and coffee! Wonderful post! I’ve become very interested in how to be more hospitable. It is not only a Scriptural mandate but a nice way to honor God. Feel free to visit my post (link provided) for some ideas. I’d enjoy hearing more of yours. Kind Regards. My grandmother makes pound cakes, covers them in aluminum foil, wraps a pretty bow around them, and then freezes them. If company comes, or the situation requires a gift, the pound cake is ready and presentable. Great article! Growing up in my house hold was really one big “every one is welcome” party. Friends of any one of my siblings (or my mom’s) were allowed in any time! in keeping with that tradition, I’ve learned that pasta (whether spagetti or mac-n-cheese) is always a welcome quicky, and tea and cookies for a shorter stop are always a hit! I like the fact that people drop by–it makes me feel that my house (and really, myself) is seen as something that makes people feel comfortable and at home !